Adhesive compositions, particularly medical adhesive compositions, often include several components that may react differently to different sterilization processes, particularly when combined with one another. The present invention is directed to methods of sterilizing different components or groups of components of a final adhesive composition. The different components or groups of components may be sterilized in separate containers before packaging the components or groups of components within a kit, and thereafter sterilizing the kit. U.S. Pat. No. 6,248,800 discloses a method for sterilizing a polymerizable cyanoacrylate ester composition in a shipping element comprising multiple individual packages of cyanoacrylate compositions. A packaging element, such as an ampoule made of glass, polyalkylene based polymers, metal foils or polyolefins, is filled with a cyanoacrylate ester composition comprising a polymerizable cyanoacrylate ester. These filled packaging elements are then placed into a shipping element and exposed to a sufficient dosage of e-beam radiation maintained at an initial fluence of at least 2 μCurie/cm 2 to sterilize both the packaging elements and the cyanoacrylate ester composition therein without gelling the composition. The average bulk density of the materials comprising all of the packaging elements is less than about 0.2 gm/cm3. In another embodiment, the patent discloses first exposing the empty ampoule to a gas stream comprising a sufficient amount of ethylene oxide to reduce the level of bioburden on the ampoule, before filling the ampoule with the cyanoacrylate adhesive. A combination of different methods may be used to sterilize the components of a kit. A package containing a mixture of adhesive (e.g., cyanoacrylate) and plasticizer can be sterilized, for example, using dry heat, while a second package containing a mixture of thickening agent, radiopaque agent and initiator may be sterilized, for example, by irradiation. The two packages may then be placed together in a kit that is in turn chemically sterilized such as by ethylene oxide or hydrogen peroxide vapor. Other acceptable component combinations and sterilization techniques may be used as appropriate. Regardless of the sterilization methods used, the respective components of the kit, and preferably the entire kit and its contents, should be sterile. By “sterile” herein is meant that the composition or component is free from viable microorganisms. In preferred embodiments of the present invention, the composition is sterilized to provide a Sterility Assurance Level (SAL) of at least 10 −3. In embodiments, the Sterility Assurance Level may be at least 14−4, or may be at least 10−5, or may be at least 10−6. wherein X and Y are each strong electron withdrawing groups, and R is H, —CH═CH 2 or, provided that X and Y are both cyano groups, a C1-C4 alkyl group. Preferred monomers include 1,1-disubstituted ethylene monomers, such as α-cyanoacrylates including, but not limited to, alkyl α-cyanoacrylates having an alkyl chain length of from about 1 to about 20 carbon atoms or more, preferably from about 3 to about 8 carbon atoms. wherein R 1 and R2 are, independently H, a straight, branched or cyclic alkyl, or are combined together in a cyclic alkyl group, and R3 is a straight, branched or cyclic alkyl group. Preferably, R1 is H or a C1, C2 or C3 alkyl group, such as methyl or ethyl; R2 is H or a C1, C2 or C3 alkyl group, such as methyl or ethyl; and R3 is a C1-C16 alkyl group, more preferably a C1-C10 alkyl group, such as methyl, ethyl, propyl, butyl, pentyl, hexyl, heptyl, octyl, nonyl or decyl, and even more preferably a C2, C3 or C4 alkyl group. Such alkyl ester cyanoacrylates and other suitable monomers are disclosed in, for example, U.S. patent applications Ser. No. 09/630,437, filed Aug. 2, 2000, and Ser. No. 09/919,877, filed Aug. 2, 2001, the entire disclosures of which are incorporated herein by reference. subjecting the kit packaging element, containing the first and the second containers, to a second sterilization process that terminally sterilizes contents of said first and second containers. 2. The method according to claim 1, wherein the first sterilization process does not terminally sterilize contents of said second container. 3. The method according to claim 1, wherein the first and second sterilization steps cause substantially no initiation of polymerization of the polymerizable adhesive composition. 4. The method according to claim 3, wherein the polymerizable adhesive is in the form of a liquid, gel or gel-like composition. 5. The method according to claim 1, wherein the at least one additional component is at least one of a plasticizer, a thickening agent, a radiopaque agent, and an initiator. 6. The method according to claim 1, wherein the at least one additional component is at least one of an initiator, a thickening agent, and a radiopaque agent. 7. The method according to claim 1, wherein the at least one additional component is an initiator. 8. The method according to claim 1, wherein the polymerizable monomer comprises a 1,1-disubstituted ethylene monomer. 9. The method according to claim 1, wherein the polymerizable monomer is an α-cyanoacrylate. 10. The method according to claim 1, wherein at least one of the first and second containers is sealed to maintain contents of said first container separate from contents of said second container. 11. The method according to claim 1, wherein at least one of the first and second containers is made of glass. 12. The method according to claim 1, wherein at least one of the first and second containers is made of plastic. 13. The method according to claim 1, wherein the first and second containers are independently selected from the group consisting of ampoules, vials, syringes, pipettes, tubes and applicators. 14. The method according to claim 1, wherein the first and second containers are compatible with e-beam. 15. The method according to claim 1, wherein the first container contains said polymerizable monomer, and said second container contains a plasticizer, a thickening agent, a radiopaque agent, and an initiator agent for said polymerizable monomer. 16. The method according to claim 1, wherein the first container contains said polymerizable monomer and at least one of a plasticizer, a thickening agent, and a radiopaque agent, and said second container contains an initiator agent for said polymerizable monomer and at least one other of the plasticizer, the thickening agent, and the radiopaque agent not packaged in the first container. 17. The method according to claim 1, further comprising sealing said kit packaging element prior to said second sterilization process. 18. The method according to claim 16, further comprising, prior to said sealing step, a third sterilization process to sterilize exposed surfaces in said kit packaging element. 19. The method according to claim 17, wherein said third sterilization process comprises exposure to ethylene oxide or hydrogen peroxide vapor. 20. The method according to claim 1, wherein at least one applicator for said polymerizable adhesive composition is included in said kit packaging element. 21. The method according to claim 1, wherein at least one material contained in said first container is incompatible with at least one material contained in said second container, at least prior to said first sterilization process. 22. The method according to claim 1, wherein at least one material contained in said first container is incompatible with at least one material contained in said second container, at least after said first sterilization process but not before said first sterilization process. 23. The method according to claim 1, wherein the first container is a glass ampoule and the second container is a plastic syringe. 24. The method according to claim 1, wherein the first and second sterilization processes are independently selected from the group consisting of irradiation, physical treatment, or chemical treatment. 25. The method according to claim 1, wherein the first sterilization process comprises e-beam irradiation at a dosage of from about 5-25 kGy. 26. The method according to claim 1, wherein the second sterilization process comprises e-beam irradiation at a dosage of from about 5-25 kGy. 27. The method according to claim 1, wherein at least one of said first sterilization process and said second sterilization process comprises dry heat. 28. The method according to claim 1, wherein said kit is sterilized to provide a Sterility Assurance Level of at least 10−3. 29. The method according to claim 1, wherein the second container contains at least one material that at least partially degrades during sterilization to become incompatible with the polymerizable monomer. 30. The method according to claim 28, wherein said at least one material that at least partially degrades is a plasticizer. 31. An adhesive kit produced by the method of claim 1.
the sterilized second container containing at least one additional component of the polymerizable adhesive composition. subjecting the kit packaging element, containing the first and the second containers, to a third sterilization process that terminally sterilizes at least exposed surfaces in said kit packaging element. 34. The method according to claim 32, wherein the first sterilization process sterilizes contents of said first container, and said second sterilization process sterilizes contents of said second container. 35. The method according to claim 32, wherein at least one of (a) said first sterilization process does not terminally sterilize contents of said first container, and (b) said second sterilization process does not terminally sterilize contents of said second container. 36. The method according to claim 32, wherein the first sterilization process does not terminally sterilize contents of said first container, and said second sterilization process does not terminally sterilize contents of said second container. 37. The method according to claim 32, wherein said first and second containers are separately sterilized by different sterilization processes. 38. The method according to claim 32, wherein said third sterilization process terminally sterilizes only exposed surfaces in said kit packaging element. 39. The method according to claim 32, wherein said third sterilization process comprises exposure to ethylene oxide or hydrogen peroxide vapor. 40. The method according to claim 32, wherein the first, second and third sterilization processes cause substantially no initiation of polymerization of the polymerizable adhesive composition. 41. The method according to claim 40, wherein the polymerizable adhesive is in the form of a liquid, gel or gel-like composition. 42. The method according to claim 32, wherein the at least one additional component is at least one of a plasticizer, a thickening agent, a radiopaque agent, and an initiator agent. 43. The method according to claim 32, wherein the at least one additional component is at least one of an initiator, a thickening agent, and a radiopaque agent. 44. The method according to claim 32, wherein the at least one additional component is an initiator. 45. The method according to claim 32, wherein said first container further contains at least one plasticizer, and said second container does not contain any plasticizing agents. 46. 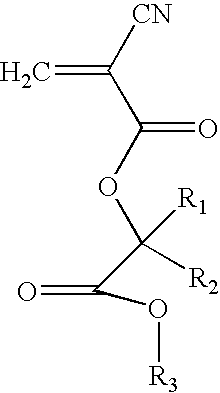 The method according to claim 32, wherein the polymerizable monomer comprises a 1,1-disubstituted ethylene monomer. 47. The method according to claim 32, wherein the polymerizable monomer is an α-cyanoacrylate. 48. The method according to claim 32, wherein at least one of the first and second containers is sealed to maintain contents of said first container separate from contents of said second container. 49. The method according to claim 32, wherein at least one of the first and second containers is made of glass. 50. The method according to claim 32, wherein at least one of the first and second containers is made of plastic. 51. The method according to claim 32, wherein the first and second containers are independently selected from the group consisting of ampoules, vials, syringes, pipettes, tubes and applicators. 52. The method according to claim 32, wherein the first and second containers are compatible with e-beam. 53. The method according to claim 32, wherein the first container contains said polymerizable monomer, and said second container contains a plasticizer, a thickening agent, a radiopaque agent, and an initiator agent for said polymerizable monomer. 54. The method according to claim 32, wherein the first container contains said polymerizable monomer and at least one of a plasticizer, a thickening agent, or a radiopaque agent, and said second container contains an initiator agent for said polymerizable monomer and at least one other of the plasticizer, the thickening agent, or the radiopaque agent not packaged in the first container. 55. The method according to claim 32, wherein at least one applicator for said polymerizable adhesive composition is included in said kit packaging element. 56. The method according to claim 32, wherein at least one material contained in said first container is incompatible with at least one material contained in said second container, at least prior to said first and second sterilization processes. 57. The method according to claim 32, wherein at least one material contained in said first container is incompatible with at least one material contained in said second container, at least after said first and second sterilization processes, but not before said first and second sterilization processes. 58. The method according to claim 32, wherein the first container is glass ampoule and the second container is a plastic syringe. 59. The method according to claim 32, wherein the first, second and third sterilization processes are independently selected from the group consisting of irradiation, physical treatment, or chemical treatment. 60. The method according to claim 32, wherein the first and second sterilization processes are independently selected from the group consisting of e-beam irradiation, γ-irradiation, and dry heat. 61. The method according to claim 32, wherein said kit is sterilized to provide a Sterility Assurance Level of at least 10−3. 62. The method according to claim 32, wherein the first container contains at least one material that at least partially degrades during sterilization to become incompatible with the polymerizable monomer. 63. The method according to claim 61, wherein said at least one material that at least partially degrades is a plasticizer. 64. An adhesive kit produced by the method of claim 32. ES2267940T3 (en) 2007-03-16 A composicon rubber or a crosslinked product used for a rubber stopper for a medicament or medical treatment.